As a PADI IDC Staff Instructor you will help raise the next generation of PADI professionals as well as gain in-depth instructor trainer knowledge. As an IDC Staff Instructor you will be able to conduct independently the Assistant Instructor course, as well as present topics in the IDC and help shape PADI Divemasters and Assistant Instructors into PADI Open Water Instructors. * Auditing a complete IDC Course. You will be assisting our PADI Course Director closely during a full IDC Program, learn how to score the candidates knowledge development, confined and open water presentations, as well as how to counsel and motivate them. The IDC Staff instructor course is a rewarding course as you are actively involved in all parts of the PADI IDC training and receive very valuable tips and techniques from our PADI Course Director and experience firsthand the development process of new instructors. An IDC Staff Instructor Candidate must demonstrate adequate knowledge of diving theory and PADI Systems, standards and procedures by exhibiting acceptable performance on written examinations. You will be required to obtain a 85% passing mark on a series of pre-assessment examination. You are required to demonstrate mastery of the PADI Skill Evaluation Circuit. To obtain this mastery all skills above a 2.0 and an average of a 4.0 or higher is required. An IDC Staff Instructor candidate must demonstrate acceptable performance of an academic teaching presentation. This involves orientation of the candidate to PADI IDC policies, procedures and philosophy. During this module, you will learn how to objectively evaluate and give positive comments to PADI IDC candidate teaching presentations. Consistency in evaluation and critique along IDC Staff members is vital to enable the IDC candidate to effectively develop teaching skills . Effective and consistent evaluation of candidate teaching presentations is the most important function of a Staff Instructor. To prepare you for this role, some preliminary training will take place. You will see from a staff perspective how a PADI IDC course is conducted and you will be able to see the development of the candidates’ abilities during the Program. 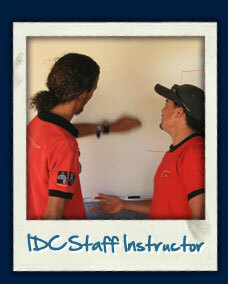 You observe all IDC training segments, evaluation sessions, and all aspects of staff organization.